Looking back to last September, Jessica dropped me a message sharing that they were having an "intimate, rustic, and artsy gathering at a rental house by the ocean on Mount Desert Island, Maine." Hook, line and sinker... I was sold. Mount Desert Island is one of my favorite places in Maine and I have been visiting Bar Harbor and Southwest Harbor every summer since I started dating my (now) husband over a decade ago. To say that I have been dying to photograph a wedding in a place that means so much to me would be a complete understatement. Add in their vision for an intimate, rustic, and artsy gathering? Where do I sign? Like with many of my couples, my relationship with Jessica & Oscar since last September has been nurtured through the wonderful world of technology with a plethora of emails and a smattering of phone calls thrown in for fun. I have been looking forward to their wedding with my fingers crossed for great weather, flowers in bloom, and a slight ocean breeze. What I could not have prepared myself for is just how absolutely incredibly their venue would be. Walking through the front door, I was immediately taken with the expansive view of the bay with a field of lupine between me and the waters edge. When you think Mount Desert Island, you think of that view. 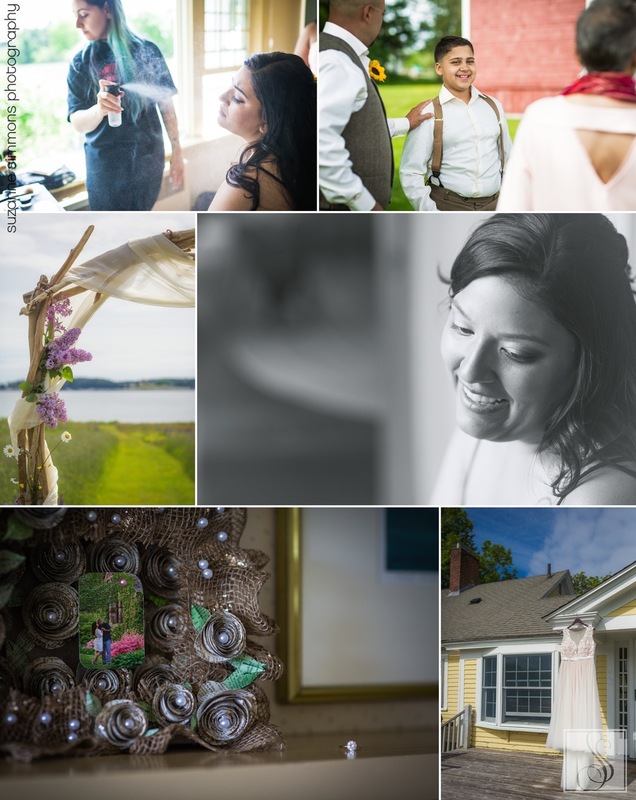 Surrounded by their closest family and friends who all traveled from afar to witness their union, Jessica & Oscar prepared for their wedding in opposite ends of the 1800s era home that was the setting for their weekend. With Jessica in her oh so perfect flowy, lace topped gown and Oscar in his suit vest, the two love bird that found each other thanks to a mistyped phone number and subsequent text message (how crazy is that?!?) met beneath a lovely old tree in the backyard for their first look. His jaw dropped, her cheeks blushed... their joy could be felt instantly. If this day was not meant to be, I don't know what is. Together we went off for Park Loop Road in Acadia National Park, an area that has been integral to their relationship over the years. We visited Sand Beach and a quiet overlook together with the early season onlookers out in full force. I love it when couple chose such a meaningful location for their portraits together. 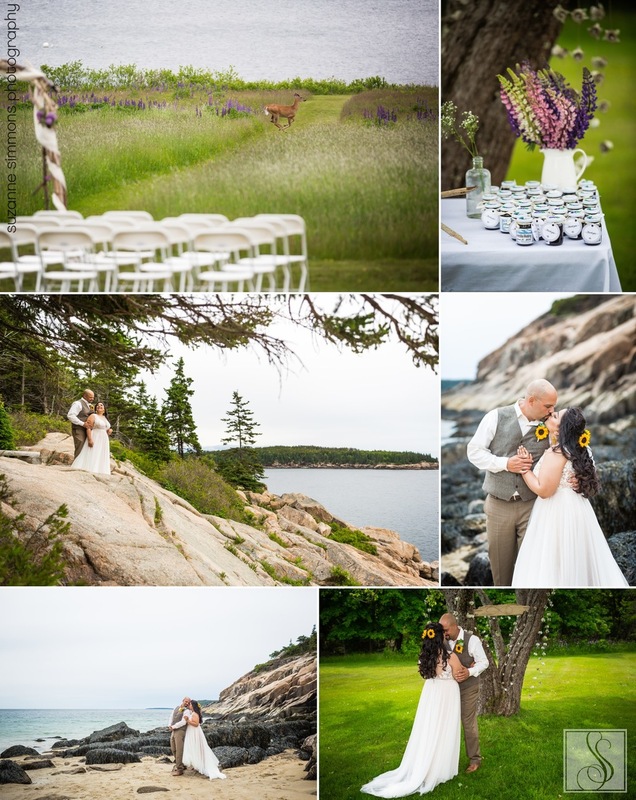 The pink granite, windswept pine trees, and yellow sand of the beach proved to be the perfect backdrop for them as their smiles and love for each other radiated around them. Shortly before the gathering started, a deer bound through the lupines, a sail boat swept through the bay, and the gulls squawked from above. Their ceremony was held beneath the arbor that they made with wood from their new home state of Vermont along with lilacs from the island. Jessica & Oscar's personal vows gave incite to just how special their relationship is and how fate really must have had a hand in their union. The newlyweds and their guests celebrated long into the night with a feast of lobsters, mussels, a delicious looking lavender cream crepe cake, and signature drinks provided by Bar Harbor Catering Company. With Erik Klausmeyer playing the perfect mix of Cuban & Puerto Rican tunes honoring their roots along with the usual mix, the dance floor was buzzing. Meanwhile, outside the tent, lawn games were a big hit as we dodged rain dropped and watched the end of their wedding day come as the clouds filled the sky. It truly was a dream come true.